The Animated Woman: Klout PERKS. Klout is back on my radar. "But JC, I got loads of free stuff from Klout! Free this, free that." Klout perks are not 'free'. 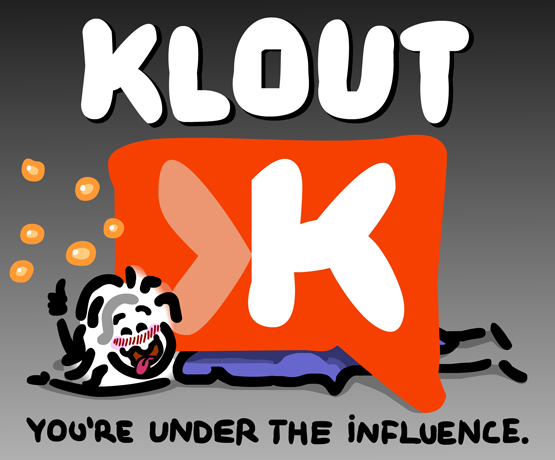 Every time someone talks/tweets/posts about their perks they are advertising for Klout the company and its clients. It's my personal view that Klout perpetuates an unhealthy type of advertising/marketing practice which allows the media to prey on human unconscious inferiority complex. This practice regularly tears down the public's self esteem, makes us feel, fat, ugly and poor and generally unworthy so that we will spend money to try to alleviate a perceived void. Klout exploits this human foible in their business model and harnesses whatever influence you have to make a buck. BTW you're awesome no matter what your score is. Here's a HUG. Have you seen Klouchebag yet? It's the antithesis of Klout, and it's amazing. I just found it. And I'm in love. It is truly awesome - mostly because my elevated anger levels make me a bit of a prat. I'm still influential in Sorting, which I can only take to mean I should have been a Nazi. Heheh, thought you might appreciate it James. And it also seems to be that the only people I really influence are the accounts created to stalk/harass/threaten me...yea, even Klout recognizes they spend a bit *too much* time focused on me...via 4 different accounts. Yep...it's not as direct, but all 4 of her accounts show on Klout as the top 4 persons I influence. I was just thinking about the perks Klout offers...it's all stuff we don't need, right? I mean if they were to offer health care, or dental coverage or groceries it might alleviate my annoyance with the frivolity of this business model. I officially (Kl)Opted Out when Klout said I was influential in dentistry. Now, I'll admit I own a set of teeth...but that's about the extent of my reach. LMAO! And here's the link to the Klout_OptOut Twibbon for anyone who wants it. Yes but I forgive you cuz you made the awesome that is PlusRout. Hell I'll even give you a +K in advertising. There are too many people obsessed with their Klout score. Drives me batty... love the face on your drawing. While there may be some folks who are "under the influence", I'd like to point out that no one "makes you" think, feel, act or be anything. You "Choose" those things, and if you can't make choices for yourself - how to think, feel, act and be, then you will be preyed upon - by others and by your own weak psyche. Yes, very true. There are many who follow, or allow themselves to be led, without questioning. There is generally a lack of critical thinking in the world. There may be something in human nature (laziness? fear?) which prefers to avoid the responsibility of making a choice.